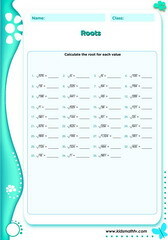 Printable tests on exponents for kids from 4th to 7th grades. Featuring exponent worksheets cover topics like: raising numbers to 2nd, 3rd, 4th etc power. e.g. 3 to the 2nd power = 2 x 2 and so on. This page also features math tests on square roots, cube roots, scientific notation and standard forms. If you are a parent or teacher of kids in primary school, this page is for you. This is especially true because each worksheet contains an answer sheet for reference at any stage. You can also make your homework tasks easy by downloading sheets on this page. Practice Exponents to 3rd power with this worksheet. Practice Exponents to 4th power with this worksheet. Practice Exponents to second power with this worksheet. Practice Powers exponents with this worksheet. Practice Powers with this worksheet. 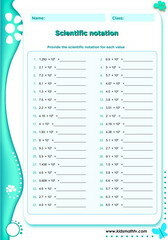 Practice Scientific notation 2 with this worksheet. 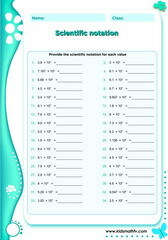 Practice Scientific notation 3 with this worksheet. 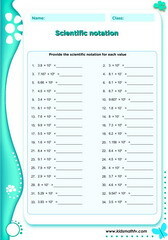 Practice Scientific notation 1 with this worksheet. Practice Square roots with this worksheet.